LeBron James, the greatest basketball player to ever play the game, has completed his warm-ups, and is standing, hands on hips, in the middle of the track, taking it all in. At 6 feet 8 inches, he towers over the small crowd of officials, press, and publicists who buzz to and fro making sure everything is in place for the imminent exhibition. A few yards away, almost lost in the crowd of hangers-on, is the diminutive figure of Malcolm Gladwell, the scrawny, middle-aged author and journalist who carries little obvious muscle on his five foot-something skeleton. He looks nervous and antsy, as if for the first time considering that he will be racing one of the finest athletes on the planet over four laps of the dusky red mondo track. King James looks confident, and perhaps just a little impatient. He is, of course, used to the fawning attention from the press, but all the same he is anxious to run the race. He understands that such an event, which (he reminds himself) will benefit Boys and Girls clubs in Cleveland, could devolve into farce unless he and Gladwell both give a good effort. Gladwell seems like a decent guy, and apparently will be able to put up a good fight for a couple of laps. Not all of his handlers and advisors think this exhibition is a good idea. LeBron could hold a charity dinner and raise the same amount of money, so why expose himself to possible embarrassment competing in an event for which he is not well-suited? He is, after all, without peer in his chosen field, a God of out-maneuvering other very tall men, rising up over them to complete any number of thunderous, soul-crushing dunks. So why, Instead of showcasing his prodigious strength and athletic prowess on a basketball court, should the king dissipate his talents by running for a little over four minutes, against an opponent who appears to have less athleticism than the average janitor at Quicken Loans Arena? But LeBron James has never been afraid to follow his own instincts. And there had been something about this challenge that made him agree to race Gladwell. Perhaps it was the challenge of showing that he was not just a world-class basketball player, but a world-class athlete. He had never told anyone, but he had always been intrigued by the decathlon, an ancient contest to determine the best all-around athlete in the world. He knew that the final event of the decathlon was the mile, or the 1500 meters, which was the same thing, really. It motivated him to think of proving that he could excel at an Olympic level. In fact, he had secretly looked up the 1500 times of Olympic decathletes, and planned on beating them. Those men were his competition, not the skinny author in spectacles who was bouncing up and down on his toes like a little kid a few yards away. Immediately after the gun goes off, LeBron takes the lead. He almost can’t help himself, and runs comfortably, hearing the crowd’s roar of approval. He knows that he must pace himself, so he consciously settles into what feels like an easy jog for him. He supposes that his opponent will try to stick with him for a couple of laps, and then fade. He feels great, and after only 200 meters, no longer hears the light tap-tap-tapping of Gladwell’s foot strikes. From here on in, it is about maintaining focus and a steady pace to run a good time, about 70 seconds per circuit of the track. As he completes the first lap, a frown of surprise crosses his face. Although he had consciously kept himself in check, the digital clock at the finish line reads 1:06 as he flashes by. That’s a little fast. He glances back to see that Gladwell is a good 40 meters behind. Better ease off the pace a little. King James lets the energy of the crowd carry him along, as he keeps up what feels like a strong, steady pace. So far, this isn’t nearly as bad as the conditioning he does several times a week in the gym. He thinks of the words of Mohammed Ali, words James posted with a video of one of his more impressive workouts: “I hated every minute of training, but I said, ‘Don’t quit. Suffer now and live the rest of your life as a champion.’” James knows that to be a champion, or to run a fast mile, he will need to suffer. He feels prepared for this. He passes 600 meters and starts to feel his legs becoming heavy. He glances back again, and see that his lead seems to have grown. He slows down a little bit more, knowing he still has a long way to go. As he approaches the finish line for the second time, he sees with some little dismay that the clock reads 2:22. He does the math quickly in his head and realizes that he slowed down more than ten seconds from the first lap. It didn’t feel like he was slowing down that much. A new feeling has taken root in his soul, as the greatest basketball player in the world continues to slow down in the back stretch. It is a dark and nameless melancholy that eats away at his resolve. Deep in the infrastructure of his quite extraordinary physique, the mitochondria in LeBron James’ muscles are finding it difficult to meet the demands of propelling his 250-pound frame at the required 12 miles per hour. For a while, James’s anaerobic energy system had met the demand, but that was a costly process, and exhausted itself after a minute or so. Now his muscles are relying on an aerobic system that is simply not used to generating so much energy for such a relatively long period of uninterrupted effort. An NBA basketball court is 94 feet, or 26.8 meters, long, A mile is 5280 feet, or 1609.24 meters, which is the equivalent of running up and down a basketball court 28 times. Few human beings on the planet can run up and down a court more quickly and powerfully than LeBron James, but the physical abilities that enable him to make repeated sprints over the course of a game, are not designed for steady, continuous locomotion. All that muscle mass that is so helpful for leaping and dunking, becomes deadweight when it comes to distance running. But LeBron James is a champion, and he does not lack for bravery or determination. He fights the melancholy, the question that rises up in his mind of why he is doing this. He thinks of the under-privileged boys and girls of Cleveland. He thinks of his Mom, who is watching on TV at home. He digs deeper. As he completes the third lap he looks back and sees that Gladwell has started closing the gap. The clock reads 3:42. Gladwell has been receiving expressions of encouragement, and perhaps pity, from the crowd since the first lap. Now he hears genuine cheers, tinged with astonishment. He runs with obvious signs of effort, and his gate is smooth but not particularly impressive. What is impressive is that he is gaining on one of the finest professional athletes on the planet. 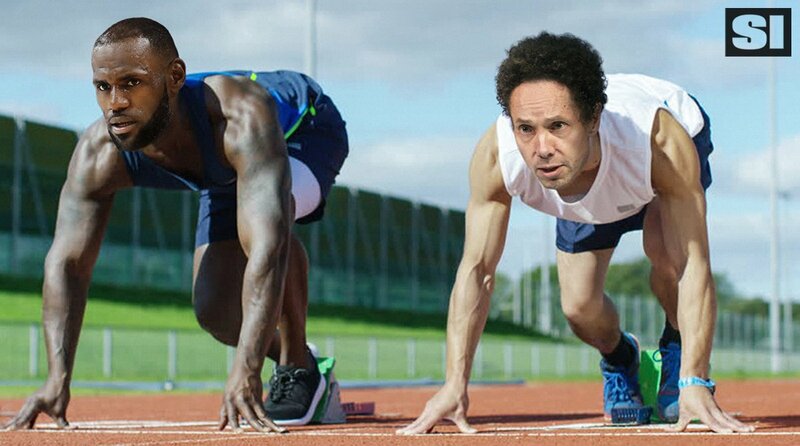 Gladwell’s face is relaxed but with a blank, earnest expression familiar to those who are familiar with the ways of distance runners. This is not easy for him, and more than once during the race, thinks back to how he used to race as a young man, with confidence in his speed and finishing kick. Age had taken that away from him, but he retains the absurdly under-appreciated talent of efficient locomotion, and, unlike James, Gladwell’s mitochondria are so far keeping up with the demand for aerobic energy to supplement the failing anaerobic processes. But the real difference between the author and the king of basketball is that, although you can’t tell from his empty expression, Gladwell is enjoying every step of the way. The great LeBron is no quitter, and although every fiber of his being is telling him he is going to die, he pushes down the final backstretch with courage and determination. With his rival only 30 meters behind, James enters the final turn with his prodigious arms and legs rowing at the air and the track, in an awkward dance to maintain his momentum. The crowd looks on, frantically shouting out with awe and pity. LeBron’s world has collapsed into a small dark place, in which only one imperative remains: make this torture stop. He is no longer thinking of the boys and girls of Cleveland, of his many Instagram followers, of his sponsors… He is thinking only of getting across the finish line before his body fails him. If he had any mental capacity left to appreciate it, which he doesn’t at the moment, he would realize as he rounds into the final straight, that he has only three lengths of a basketball court left to run. Years later, America will remember the two-time NBA champion was never as vulnerable, as awkward, and as courageous as he was coming down that home straight. LeBron James held off Malcolm Gladwell by 5.5 seconds, winning the first and only middle distance race of the great basketball player’s career. The event raised a lot of money, which was very much appreciated by the youth of Cleveland. LeBron’s time of 4:59 set off a new round of controversy and speculation on the Internet, which never rests, about how fast he could run if he, you know, really trained for it. No one was convinced. LeBron James refused all subsequent requests to ever run a mile, or any other distance, again in his life. In later years, he sought out, and received, Ashton Eaton’s autograph. Malcolm Gladwell proved to be a worthy, if somewhat goofy opponent. He declared that he was “very pleased” with his time of 5:04, noting that it was his best in several years, and that he had really enjoyed the experience. He coyly avoided confirming speculation that his next book would be an extended study of the hidden talent of endurance. The American public went back to watching Basketball, Football, Baseball, Hockey, and NASCAR, and continued to ignore Track and Field. In a small town somewhere in the heartland, a small and sad-looking kid, whose Mom had to use a clothespin to keep his track jersey from falling off, began dreaming of winning an Olympic gold medal. This entry was posted in Attempts at Humor, Track, Uncategorized and tagged LeBron James, Malcolm Gladwell, Mile Race. Bookmark the permalink. 5th Avenue Mile yesterday – Gladwell with a 5:11 at 54 years old, age graded 4:23. I still think he would clobber James.